Congratulations on your engagement! So, you’ve set the date, booked the venue and now all that’s left to do is to decide on the perfect wedding car. Good news – you’ve come to the right place. Here at Status Luxury Vehicles, we pride ourselves on providing comprehensive wedding transportation solutions that allow the bridal party to sit back and enjoy their special day. 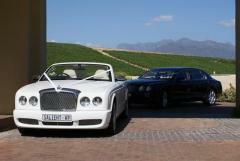 The correct wedding car hire is always the last thing on any new bride or groom’s mind. Thankfully, it is the first thing on ours. We wish you the best on your engagement. After all the other planning has taken place, it is time to decide on the perfect wedding car. We also have some good news, you have come to the best site for hiring a wedding car! At Status Luxury Vehicles, we want the bridal party to sit back and enjoy their wedding day, and let us concentrate on providing comprehensive car hire for their special day. Without a doubt, wedding car hire is highly stressful and we realise that after doing battle with the various functions of your wedding which must be set into motion, one of the last things you would want to worry about is whether or not your wedding transport will adhere to the various particulars pertaining to your wedding day. We have taken care to mold our wedding car hire packages to suit your needs, and to provide a service that will take care of all the little details. Promptly arrive to collect you from the location of your choosing. Have a dapper and qualified chauffeur. Be in an immaculate condition, as breaking down ten miles outside of your wedding venue is not a concern you should have to worry about. We have a large selection of suitable wedding car rentals that have been chosen to appeal to the full spectrum of even the most challenging of customers. Simply put: pick the car that best suits your style and your personality. For the adventurous we offer a range of self-drive wedding cars to choose from, such as the Aston Martin Volante or Porsche Boxster S. Drive yourself and your bride to the steps of your reception in red carpet style. It is even possible to transport your whole party in a similar fashion. For example, the happy bridal couple could be transported in a Mercedes S-Class, letting your friends and family follow suite in one of our many Mercedes C-Class’. Whatever you desire, we will provide the solution. At Status Luxury Vehicles, we will ensure that your wedding day goes on without a hitch, regardless of what your choice of wedding car rental is. Email us your request today, we will then promptly respond to your query.